The PDF file "Chapter 2 - What has come before" is no longer available at FASA. When the file becomes available again, it'll be linked here again. While we're still waiting for the Earthdawn 4th Edition Gamemaster's Guide, one part of it fans were really asking about was shared by FASA Games. 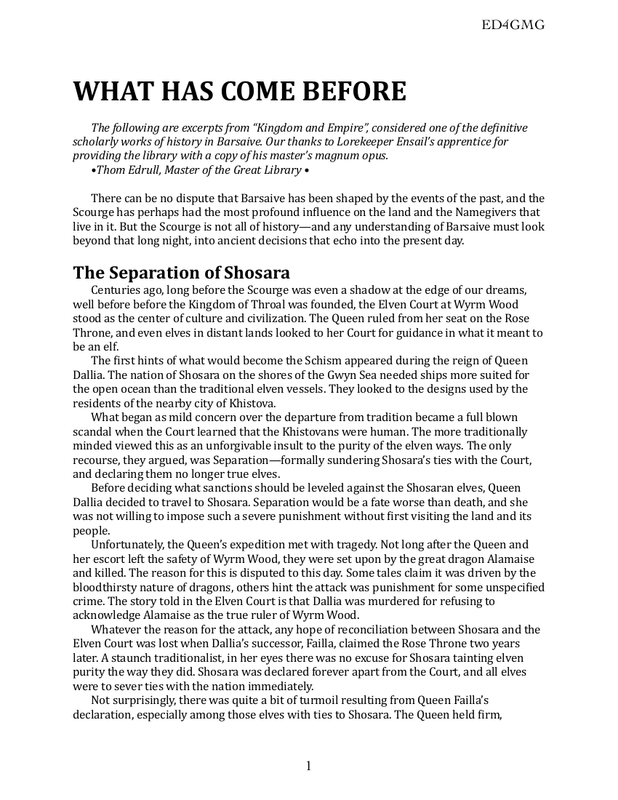 The part explaining the events leading to the current Earthdawn 4th Edition timeline. Yes, that's right. If you missed the latest FASA Games update on their blog here is the link to the Chapter 2 ("What Has Come Before") from the coming Gamemaster's Guide, in which you will find the revised history chapter, covering the events of the war and how the current political situation in Barsaive came to be. If you have backed the Earthdawn 4th Edition project on Kickstarter, check you Kickstarter messages to download addtionaly chapters 8 and 10! 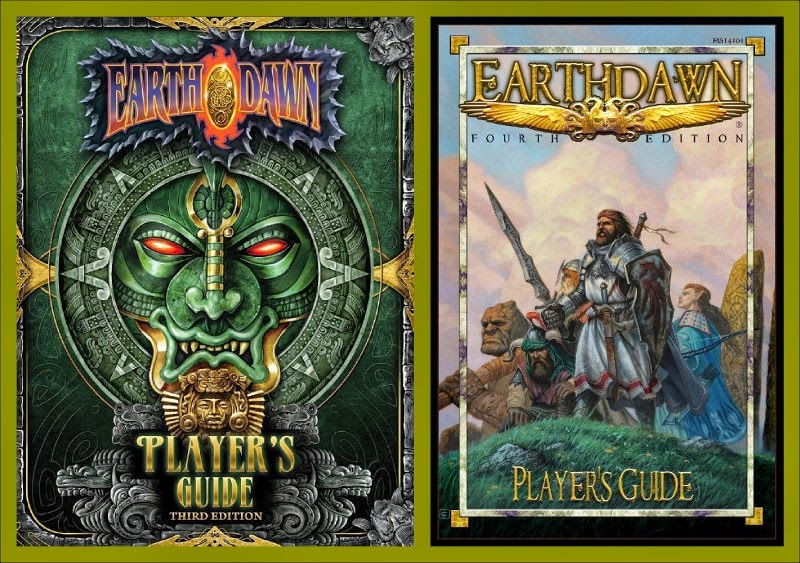 Looking at the cover of the new Earthdawn Fourth Edition Player's Guide and still wondering what are the changes? Wandering through the G+ astral space (those Nethermancers, wandering in netherworlds all the time...) Mordom found a link to an interesting summary of all general changes between 3rd and 4th editions so far. The author mentions the changes and gives his opinion about them. It's short, and definitely worth reading. Last year Lester Ward shared a draft of a Dungeon World hack using Earthdawn setting. It was a very interesting concept, but it still needed more work and tinkering. Now Lester Ward came back with a new version of the hack. Using the feedback from the Dungeon World community and other people he created as he says "a form that is as complete as he ever intend to make it". It's not a complete game. It's a seed on which you can expand your Dungeon World game in the Earthdawn setting. But it's a really fruitful seed. If you like Dungeon World mechanic, give a try! Lester shared two download packages: the PDF and the source files. Visit his site DivNull Productions to download them! Back in September 2014 we already converted a fanmade character sheet to the Earthdawn 4th edition rules with the help of Mogan Weeks. The character sheet is "unfortunately" no longer available at the download section at FASA games. Now, after the release of the Earthdawn 4th Edition Player's Guide PDF, FASA provides an official 4th edition character record sheet on their download page. The sheet uses the D12 dice table and it provides on 2 pages space for basic character stats. I would say for high circle characters it is not useful, but to start with Earthdawn it should be good enough. It simply provides the base stats of your char in a good overview, nothing more nothing less.